Today the family more or less was lazy around the house, every once in a while working on the holiday decorations. I whipped together three recipes of sugar cookie dough for this coming week, and we finished decorating both Christmas trees. 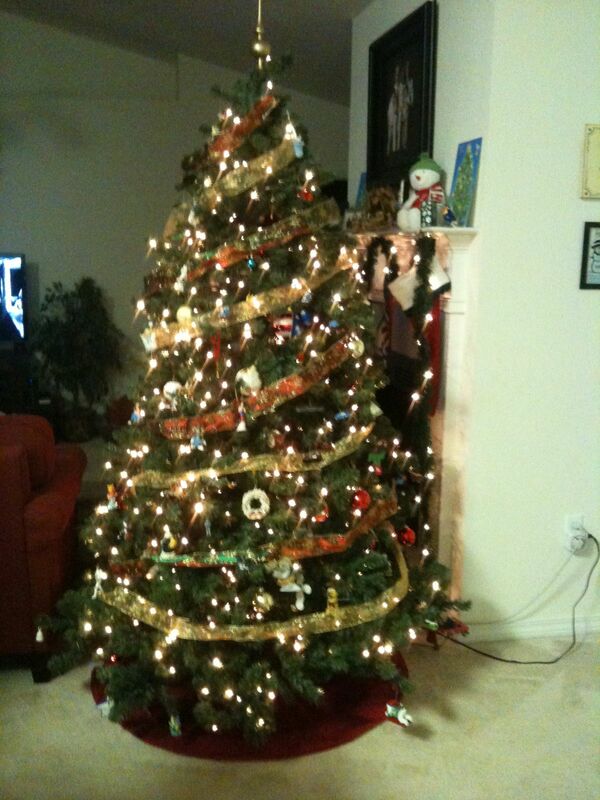 This year, for the first time, we put up two Christmas trees. We started to run out of room on the one tree we’d had for years with the kids’ craft ornaments. Yes, how “first world problem” of us, right? But since this house had the space, and last year right after Christmas we could get a 6 1/2′ pre-lit tree for about $10, we decided to give the kids a tree of their own. 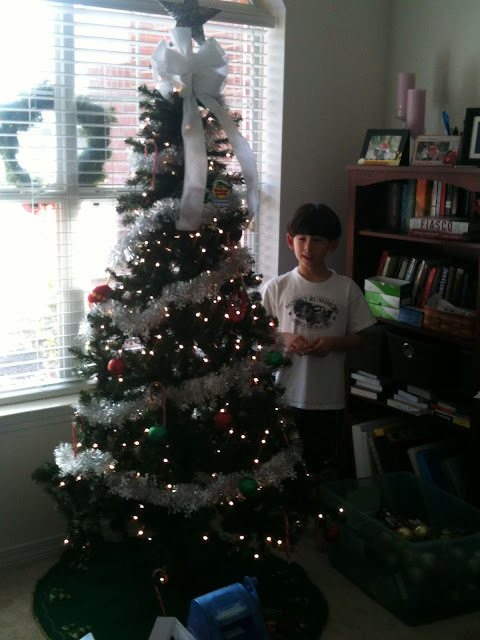 Jacob chose the garland, star on top AND the bow on top! 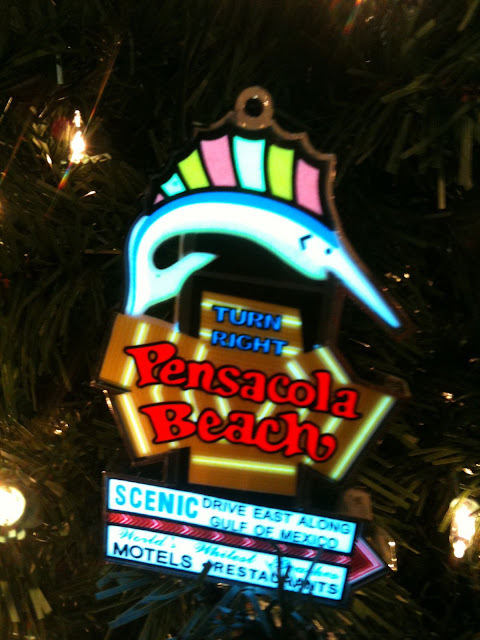 If you look between the two tail pieces of the big bow at the top of the kids’ tree, you’ll see my new Pensacola Beach sign ornament, courtesy of my thoughtful husband. He knows how much I love this sign!!! This ornament connects to the light string and blinks similarly to the real thing. The connection is compatible with the boys’ new little tree, not the grown up tree, unfortunately. 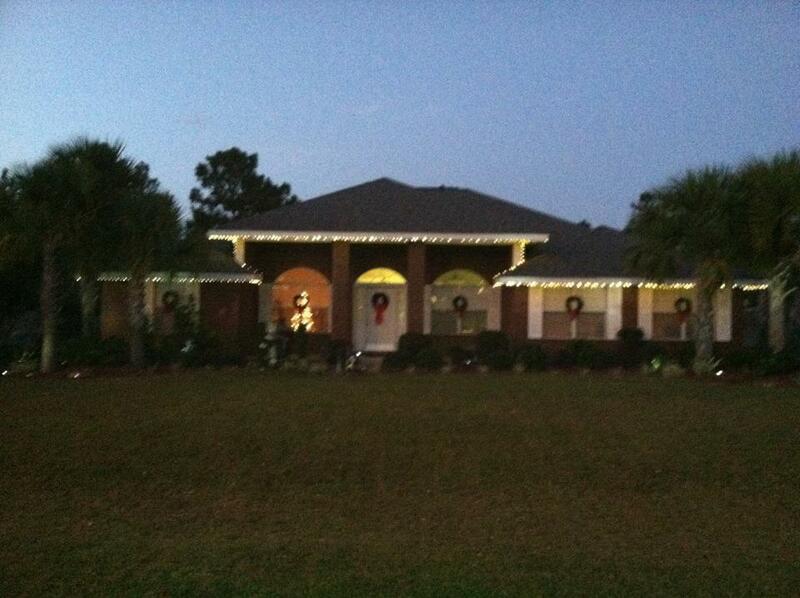 This afternoon we put up the outdoor lights. And by “we”, this year it had to be “me”. Dave was considering just wrapping the lights around our small bushes, but I really really like lights on the house, so I offered to do it this year. There was no way Dave should have been doing this stuff! I counted to 10 a few times, got a hug from Timmy, and went back to work. I only actually had to be on the roof for the two transitions between the upper and lower roofs, but the rest of the time I was on assorted ladders underneath the soffit tucking the light’s wires up into part of the soffit moulding. Here’s this year’s finished product, courtesy of Dave’s iPhone camera that worked better in the sunset than mine. You can see the boys’ Christmas tree in the window just left of the front door.